The community college scheme is to offer low cost-high quality education locally that encompasses both skill development as well as traditional courseware, thereby providing opportunities to the learners to move directly to employment sector or to move up in higher education sector. The community colleges are to offer knowledge-skill mixed programmes of different durations depending on the need of local industry leading to a certificate at various levels of NSQF. To provide employable and certifiable skills based on National Occupational Standards (NOSs) with necessary general education to Senior Secondary School pass-outs, with general education and /or vocational education background. To offer bridge courses to certificate holders of general / vocational education, so as to bring them at par with appropriate NSQF level. To provide entrepreneurial orientation along with required skill training for self-employment and entrepreneurship development. 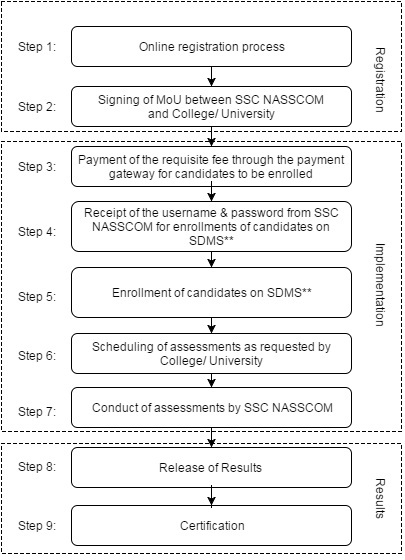 The existing universities and colleges recognized by the UGC under section 2(f) and 12(B) of UGC Act, 1956 and receiving General Development Assistance are eligible for implementing the Scheme of CC. The eligible universities and colleges may submit the proposal under the Scheme to the UGC as per Annexure – A of the guidelines. Self financing institutions recognized under 2(f) and 12(B) of the UGC Act 1956, and not receiving general development assistance from the UGC may also be considered for approval under the scheme. They will abide by the guidelines of UGC as amended from time to time, but will not be entitled for any financial assistance under the scheme. The CC should not be a part of departments of a university /college and it should have a separate entity within the institution. The Government / Society / Trust or a Company may also set up an independent Community College, to implement the scheme and may offer courses as per the extant guidelines. The financial assistance to such community colleges will be governed as per the prevailing policy of the Commission.